Home trampolines are popular with children and you often see them in the backyards of many families. According to the Consumer Product Safety Commission and American Academy of Pediatrics, in 2014, there were 104,691 hospital emergency room-treated injuries associated with trampolines, mostly in young children and teens. And tragically, since 1990, there have been at least 6 deaths of children under age 15 involving trampolines. You just have to look at some recent trampoline accidents to see how easy it is for kids to get hurt while playing on a trampoline. Most of these injuries didn't involve falling off the trampoline, which is how parents typically think accidents occur. And tragically, children sometimes die on trampolines. 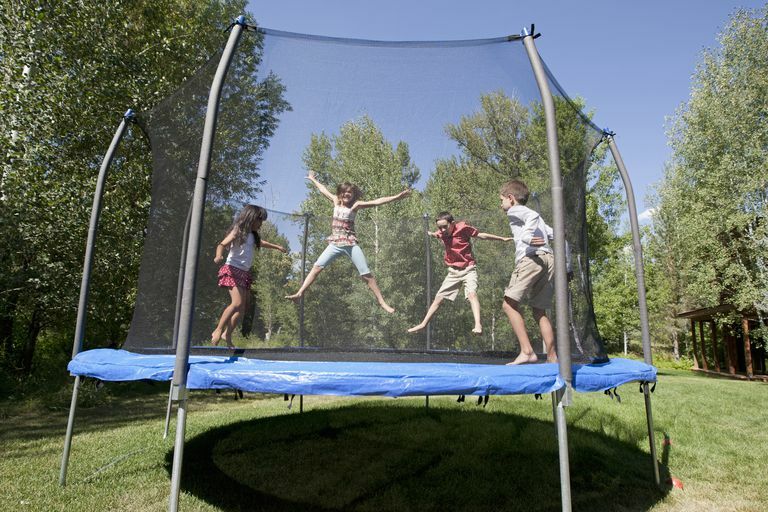 To help avoid injuries from trampolines, you should follow the recommendations of the American Academy of Pediatrics and American Academy of Orthopaedic Surgeons and simply never "purchase a home trampoline or allow children to use home trampolines" and don't make trampolines a part of outdoor playgrounds or play equipment. Keep in mind that even in a supervised training program, children under age 6 years should not use trampolines. So the basic advice for a parent that is considering buying a home trampoline is that you should simply not do it. place the trampoline in a well-lit area, at ground level, away from any structures with which your child could collide if he falls off, including trees, walls, and fences, etc. install an impact absorbing safety surface material around the trampoline, such as wood chips, sand, or mulch, etc. Concrete is not a good protective surfacing material if your child falls off the trampoline. It is also important to regularly check the trampoline to make sure that it is in good working condition and that it hasn't been involved in a safety recall. Keep in mind a trampolines padding and enclosure net will likely last longer than the frame and mat and will need to be replaced at some point during the life of the trampoline. American Academy of Orthopaedic Surgeons. Trampolines and Trampoline Safety: Position Statement. September 2010. CPSC Safety Alert. Trampoline Safety. Publication 085.